Someone has been tampering with Earth’s Ozone Shield, and judging from the malfunction locations, Intergalactic Diplomat Katherine Morgan is convinced it’s more than a mere technical glitch. Worried for the health and safety of her people, she petitions the Peace Keeping Intergalactic Council to conduct a full investigation and offer any kind of assistance Earth might need in the event of an ambush. Unfortunately, the only assistance they can offer is in the mercy of the impetuous King of Salatiel, a man whose heart Katherine stomped on more than ten years ago. The terms of the arrangement? 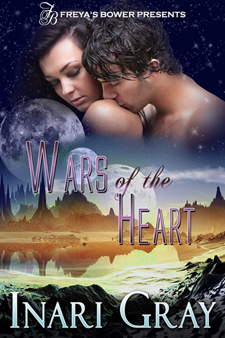 Force an alliance, get Ja-el Lamar to yield at the threat of losing his kingdom. She didn’t take into account how treacherous it would be, faced with everything she thought she no longer cared about, everything she left behind. Meanwhile, Ja-el has an agenda of his own. He hates the Peace Keeping Intergalactic Council and everything it stands for. He’s never trusted those in power there and he certainly won’t start now. Especially not when they’re sending Katherine Morgan in his direction. A woman he vowed to never see again. Whom they all know has the power to destroy him.